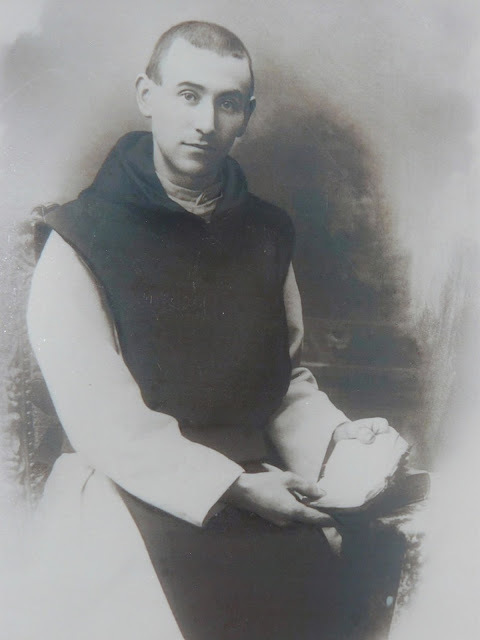 A rather unknown Cistercian monk and Blessed of the Church is Joseph-Marie Cassant (March 6, 1878 – June 17, 1903). He eventually found his vocation with the Cistercian monks of St. Mary of the Desert (France) on December 5, 1894. Solemn vows were professed on May 24, 1900, the feast of the Ascension. Brother Joseph-Marie’s personal charism, developed with the help of his novice master, seems to be based on the contemplation of Jesus in His passion and in the cross which leads to his teaching the love of Christ: this is the way of Jesus’ heart. In preparing for the priesthood, Brother Joseph-Marie understood his ministry as totally eucharistic. The young brother was ordained priest on October 12, 1902. Almost immediately he was diagnosed with TB of which his sufferings were kept silent. His abbot, feeling the gravity of the situation, sent Joseph-Marie to be with his family for seven weeks despite his growing weakness. The monastery’s infirmarian was incompetent and likely advanced the effects of TB. Saint John Paul beatified Father Joseph-Marie on October 3, 2004. The sheer ordinariness of his life has been noted by some: 16 quiet years at Casseneuil and 9 years of monastic enclosure spent in doing the simplest of things: prayer, studies, work. They are indeed simple things, but lived in an extraordinary way. They were the slightest of deeds, but performed with limitless generosity. Christ imbued his mind, clear as the water that leaps from a spring, with the conviction that God alone is our true and highest happiness and that his kingdom is like a hidden treasure or a pearl of great price. The message of Fr. Joseph-Marie has great meaning for us today. In a world filled with distrust and often with despair but thirsting for love and kindness, his life can provide an answer, and in a special way to today’s young who seek meaning in their lives. Joseph-Marie was a youth without any standing or worth in the eyes of men. He owed the success of his life to a meeting with Jesus that redefined his very existence. He showed himself a follower of the Lord in the midst of a community of brothers, with the guidance of a spiritual father, who was to him a witness of Christ as well as one who knew to receive and to understand him.